I could probably dedicate an entire book to our White Noise journey. When we had Henry (over six years ago now, time flies when you're having fun!) we started with the very best of intentions. We'd researched what we should and shouldn't do to encourage healthy sleep patterns and associations and certainly weren't going to allow our bundle to become dependent on white noise to help him settle - that would be ridiculous! All our baby would need would be a little dab of essential oils massaged into his feet and then we'd be able to 'put him down awake' while chortling smugly at all the other silly billies who were making a rod for their own backs by blasting the hairdryer for twenty minutes or putting the Moses basket next to the tumble dryer. I think it was approximately two days before we cracked under the strain of relentless colicky crying and zero sleep and decided we would trial a spot of white noise ('as a one-off') played through our phones. It was, quite simply, a revelation. It didn't solve all of our problems, of course, but it helped a tiny baby Henry to fall asleep and stay asleep and from there began our love affair with low frequency vacuum cleaner noises. The problem with playing white noise via YouTube/iTunes/Spotify, was that we were constantly reliant on our phones or the iPad being next to the baby. We had a bash at using speakers connected wirelessly to our phones, but fell out of love with that option the day I forgot the two devices were paired and blasted the audio from a horror movie trailer (playing on my Facebook timeline) straight up to the nursery. Not recommended. This was followed by us panic purchasing several white-noise bears and other cuddly creatures with sound boxes hidden inside them. Ones with cry sensors that would 'kick back in' if the baby stirred, or play your chosen noise for a certain number of minutes. Between our various noisy bears and smartphones we managed just fine to keep up with our hoover-audio habit when baby Jude joined the party three years later. This year, after becoming the proud owners of our third baby, we (or rather my husband) felt compelled to Google 'white noise machines you can plug in' after one of the cuddly options yet again ran out of batteries in the middle of the night. 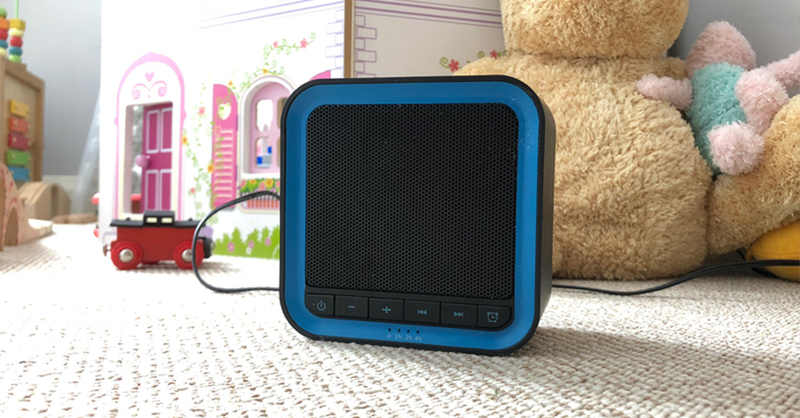 Step forward, the Avantek White Noise Machine, which plays 2o 'soothing natural sounds' continuously or for as long as you want (it has timer settings) and is mains-powered, The Dream. I posted about it on my Instagram Stories a couple of weeks ago and have already had loads of messages from mums and dads who have followed suit and are reporting back to say, "OMG it's brilliant!!!" so this is me simply sharing the love. It doesn't look as pretty as the cuddly ones but it does its job and I CANNOT RECOMMEND IT ENOUGH. It's nice to imagine a time in the future when our family won't be reliant on the background hum of a fan to drift off to to sleep but until then, this bad boy is the bee's knees. Available from: Avantek, via Amazon. Did I pay for it? Yep! As I type this, I have just put a very cross baby Wilf down for a nap (with the white noise blasting, obvs) and MY GOD he has been hard work today. I know it's not his fault, I know he is never deliberately 'hard work' but his teeth have been causing him no end of bother and Jesus, don't we know it! I'm pretty sure he has been teething since the moment he came out. We have trialled loads of teethers since and the best one by far is My Friend Goo, a lightweight natural rubber beauty. 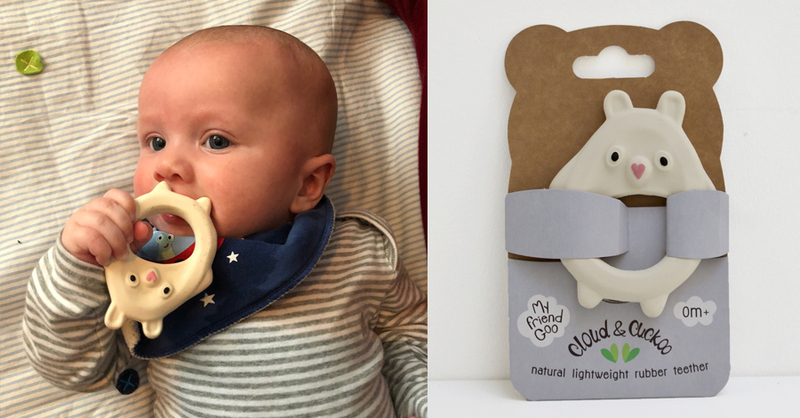 For Wilf, the charm comes from the fact that Goo is super easy for small babies to keep hold of (a triumph where many others have failed), which makes him a a great chewy companion for the pram or baby bouncer. We (or rather Wilf) really recommend Goo. Available from: Cloud and Cuckoo. We're big fans of the IKEA Leka range and this mat has been a gem. It looks good, can easily be machine washed (absolutely essential when you have a refluxy baby) and is also really good value. We also bought the wooden baby gym for £20 from the same range, which, compared to other baby-entertaining apparatus on the market, takes up a lot less space! Did I pay for it? Yep. I love the story behind these. 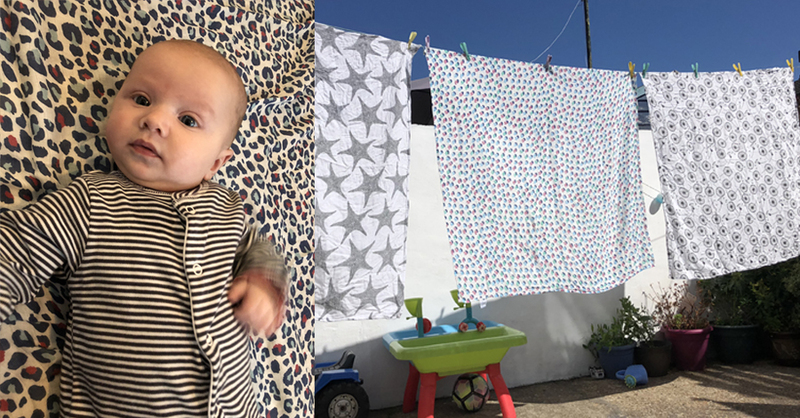 Etta Loves founder, Jen Fuller, said she wanted to create muslins that were 'functional, developmental and stylish' after noticing that her 4-week old little Etta was staring at the pattern on her top. 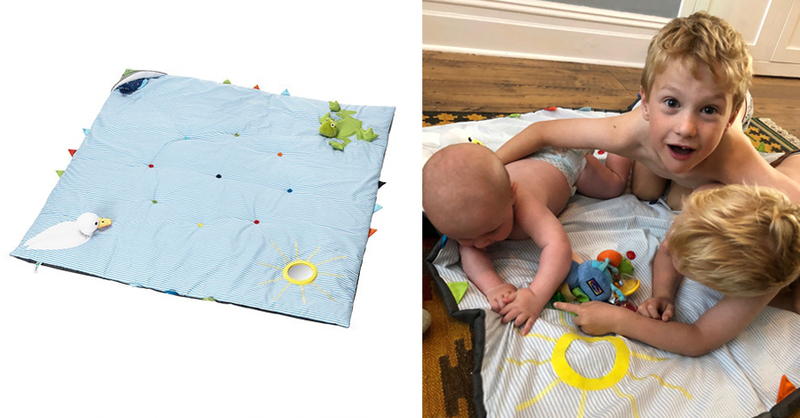 So, as well as being soft and absorbent, these muslins have been designed with input from an early years visual expert, to ensure that they stimulate babies' visual and cognitive development. 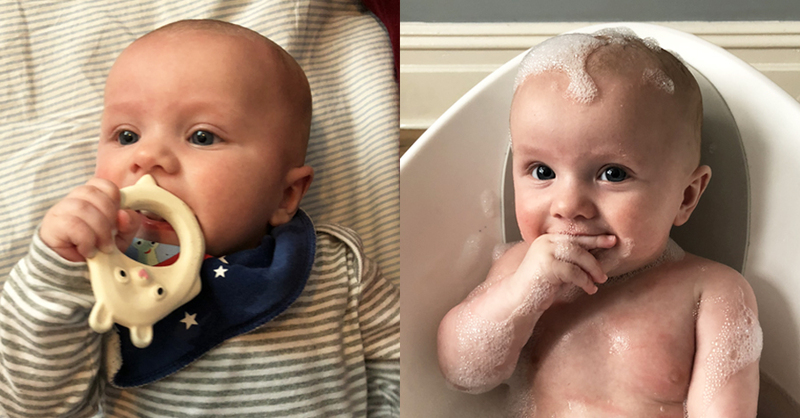 What that means in real terms is that baby Wilf is very often transfixed by their patterns AND they’re extra large, which is oh-so-useful when you have a sicky baby who easily saturates a small muslin in one sitting. They look amazing, too - I've been asked several times about the leopard print one when out and about (you know you're a parent when you're having a muslin chat in the Co-op). Did I pay for it? No, we gratefully accepted these as a new-baby gift and have used them loads since. When I was pregnant, I saw trillions of people raving about these baths. To be honest, it was a real case of 'Instagram made me buy it' but I'm glad because it's been ace! 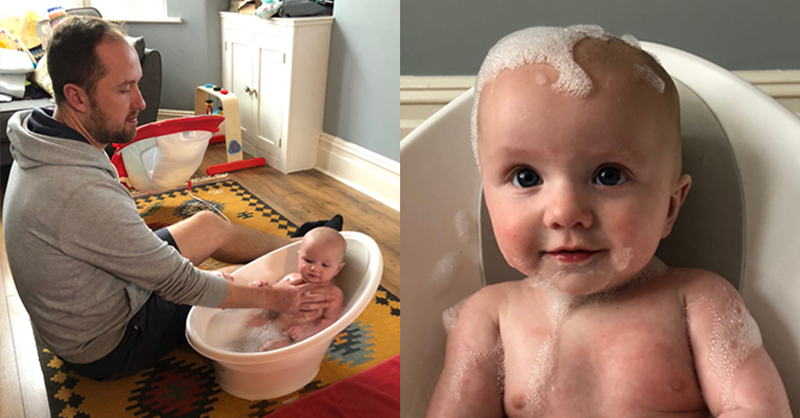 It has a bum bump to help with Wilf's posture plus a foam backrest which is much softer against his head than the old baby bath his big brothers had, and he doesn't slip and slide around as much. Really well-designed, would definitely recommend it.